Everything grows from love – confidence, joy, resourcefulness, kindness, compassion, acceptance and peace. You convey brain-boosting love to your children every day in a million ways. 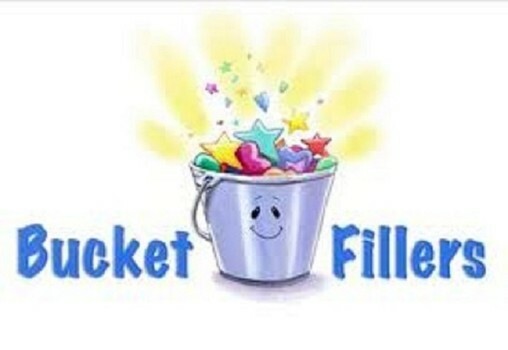 Your messages “fill their bucket” just like the bestselling book How Full is Your Bucket? For Kids by Tom Rath and Mary Reckmeyer. Toddlers may not fully understand how their words and actions fill or dip into someone else’s bucket. But their ability to feel strong and capable in themselves, to care and share about others, is directly related to your ability to “fill their bucket”. Your child knows your love from your words and your hugs, from all those meals and diapers, and all those bedtime books and songs. Feeling loved is an extraordinary gift. Your child grows to be a unique person because he knows he is lovable. Find ways to give your child a “bucket of love” regularly. It can be a real bucket that’s filled with pictures of your child seeing all the ways others care about him or her. It can be a giant bucket drawn with washable markers on a whiteboard and magnetic photos. Or, save the pictures on your phone in a “bucket of love” file. Review the pictures as part of a morning or bedtime routine so that no matter how challenging the day is, your child begins and ends with a full bucket. Take pictures of your child being helpful and being uniquely who they are. Let your child “count” all the ways you “fill a bucket” of love. What fills a child’s bucket? All of these are everyday bucket-fillers that let children know you think they are powerful, important, smart and helpful. Toddlers know what it feels like to lose a little from their bucket, whether it’s from a tantrum spilling out or from someone else taking their toy. Show your child that you are nearby to help. Again, the bucket metaphor maybe too abstract to toddlers but the metaphor may help an exhausted parent find the stamina to respond with patience especially when it’s tantrums and meltdowns that causes the bucket spillage. It’s the reassuring moments the patch the holes in your child’s bucket. These are the bucket fillers that in a few years teach your child inner calm and emotional security. Toni Morrison once said that every child should see their parents’ eyes light up just for them – not for what they do but just for “being”. The smile, the acknowledgement. It’s pretty clear that this is really hard when you’re tired, stressed and running on empty. So be sure that you are filling up your bucket and never take the easy times for granted. Young children might well be their own kind of bucket drain – testing, pushing limits, making simple tasks complicated and well organized people half-crazed. Children make a ton of mistakes. When a child is isolated and alone after making a mistake, he loses something substantial from his bucket. What he really needs is guidance without guilt and shame. Make solutions and problem solving active strategies for bucket filling. Sharing and caring are complex concepts for toddlers. But everything begins with a full bucket. Fill your child’s bucket and keep refilling. You’ll see the love grow and spread all year long.